This building is always going to have a special place in our memories. 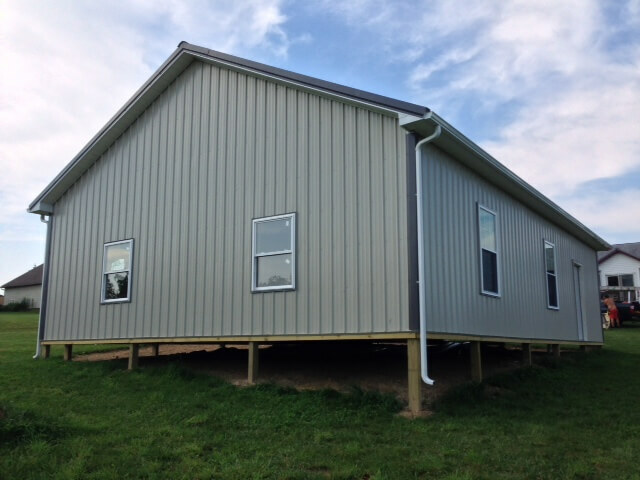 It is one of the very first buildings constructed using Endura Metal Roofing and Siding, the latest addition to our growing list of in-house manufactured pole building materials. We started with roof trusses, then added Tuff-Post, our line of manufactured posts. Now with Endura Metal we've got the whole outer shell covered. With us manufacturing our own pole building material we're cutting out the middleman and offering significant savings over our competitors. But enough about us, let's talk about the building. Our customer was seeking a roof pitch to match the one on his house to keep an even and uniformed look across his property. We designed the building based on a 6/12 pitch and were able to fit in all of the other elements they wanted. 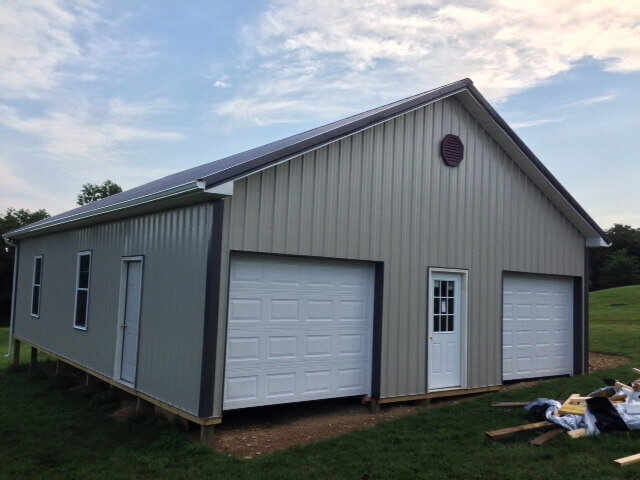 Two 8x8 Clopay garage doors are featured on the Gambrel end with a standard entry door centered between them. As this garage is tended for regular usage the customer wanted to ensure plenty of natural daylight would be available, to help conserve electricity. In addition to the glass in the Gambrel end entry door 4 widows were added, 2 of the left eave side and two in the rear Gambrel end. Being double hung windows they will also provide great cross ventilation. 1' overhangs with vinyl soffit also provides ventilation along with a front-end Gambrel vent. This pole garage will be used for vehicle storage once the fill and concrete are added to level out the grade. A highly functional and versatile building, and one of the first to feature Endura Metal; a name you'll be hearing again and again.